Austin Hip-Hop Scene: BBoy City 18 this weekend! Our great city of Austin, TX is full of great things to see and do. And every year, in May, Romeo Navarro, the BBoys & BGirls and this wonderful city plays host to one of the most extraordinary events this city, state, country, world will ever see. The hippest, hoppest, baddest dancers in the world swarm into Austin and battle it out on the dance floor. If you've never seen a BBoy City event, you ain't seen nothin' yet! B-Boy City is one of the First, Biggest, Realest bboy/bgirl hiphop festivals in the southern United States. Every April in Austin, TX, b-boys from all over Texas, the surrounding states, states across nation, and a few international locations, come to compete and spectate. B-Boy City keeps the true competitive spirit of hip-hop alive by holding battles for dancers, b-girls, poppers and dance crews. B-Boy City's uniqueness has increasingly pulled in spectators/performers from the other elements of hip-hop, such as emceeing, djing and graf writing. Competitors from B-Boy City are now internationaly renowned and scattered all over the globe. During the 3-day festivities, besides the competition, B-Boy City includes a movie screening/film night, buy-or-sell trade show, art & photo gallery and live stage performances. Throughout the year, the B-Boy City team are devoted to keeping the scene/culture alive by hosting monthly local events, supporting other related events, teaching, personal training, after-school programs, mentoring and more. We are working towards our 13th year. We are here for Support & Assistance. For the Street Dancers/Bboys&Bgirls, By the Street Dancers/Bboys&Bgirls. VIP Boat Party 1pm-5pm, Lake Travis. BBoyCity Park Jam. Circle King of the Park / BBQ. Hey that's my photo on the top of that flyer. 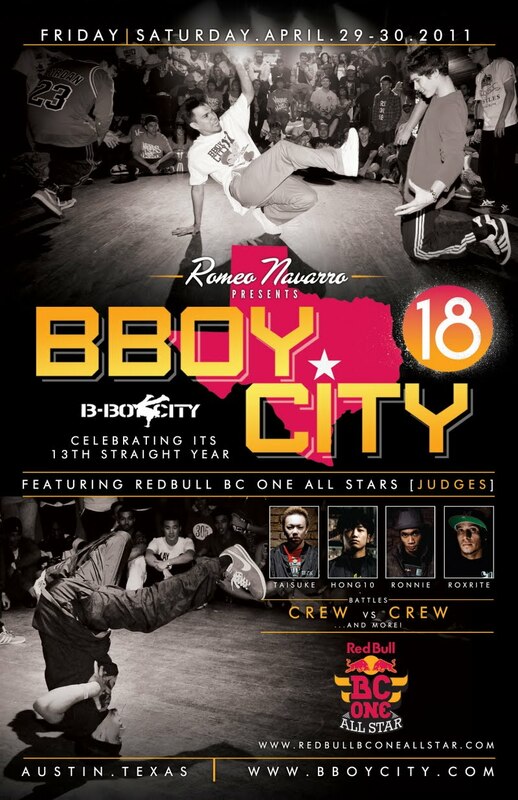 Bboy City was crazy this year with all of the celebrity bboys.